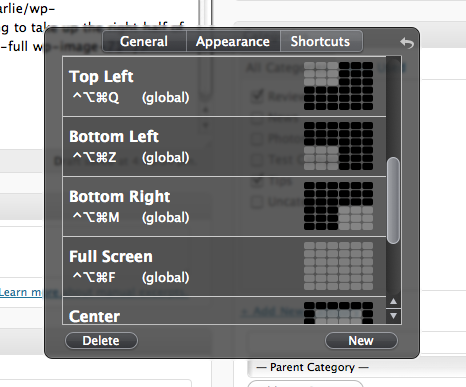 or create shortcuts for commonly used window placements. I have shortcuts for all corners of the screen, center, full screen, left, right, top and bottom. 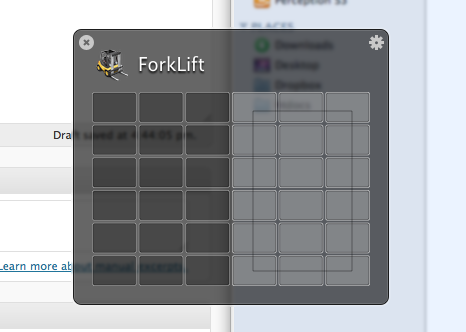 I also have some for certain apps like 2/3 of the screen for my browser. All of Divvy’s shortcuts are available when the preferences pane is open and it also gives you the ability to assign global shortcuts that are accessible at any time and in any application. Divvy is awesome. It’s a very simple program that you will find yourself using all day long. I used to work with a mouse mainly because I needed to drag and resize windows, but now it stays in the desk drawer. I’m sure it has already saved me hours of time and has paid for itself a few times over (it’s $14 and is available in the Mac App Store). I have used Size Up and Cinch in the past I prefer Divvy hands-down. If you aren’t currently using a window management application I highly recommend Divvy, but as with any app, it’s not what tool you use but how well you use it. What are your favorite shortcuts? I would love to hear any other Divvy tips that you have in the comments.